Books in Northport: We Used to Call It "Typing"
Think of the big drums called tympani, and you’re on the right track. 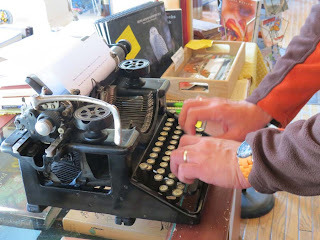 Fingers strike keys, keys move type, type strikes paper on platen, leaving inked impression. The first commercial typewriter dates back to 1868 and the first office typists were all men. That’s because secretaries in those days were all men. (Also, the typewriter was a machine, right?) Later, as women entered the field, one full-page magazine advertisement (I used to have the magazine, but it’s gotten away from me) showed a young woman using its product under the banner “THE KEYS THAT GAVE HER FREEDOM!” I confess I never felt that way myself when I worked in offices. One generation’s freedom is another’s captivity. 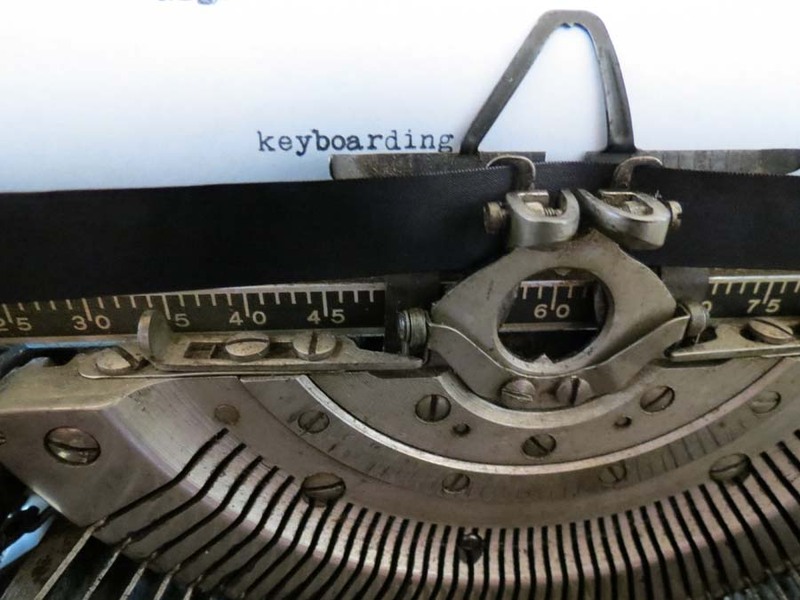 Where would the modern mystery novel have been without mysterious typewritten messages? The anonymous letter-writer uses a machine rather than a pen, realizing that handwriting is identifiable by experts. Ah, but the individual typewriter, too, has its tell-tale quirks. Perhaps one letter is slightly out of alignment or not hit with the same force as the others. Find the typewriter, and you’re on your way to solving the crime! As is true of older automobiles and farm equipment, the workings of a typewriter are visible, so when something is not working, close visual inspection can often illuminate the problem. Mechanical objects, like their products, reveal themselves to an investigator, who does not need to sit paralyzed and helpless before a sealed “black box” but can “take a look under the hood,” so to speak, and tinker. There’s a nice work: tinker. Mechanical objects are more complicated than pots and pans but accessible to eyes and hands. 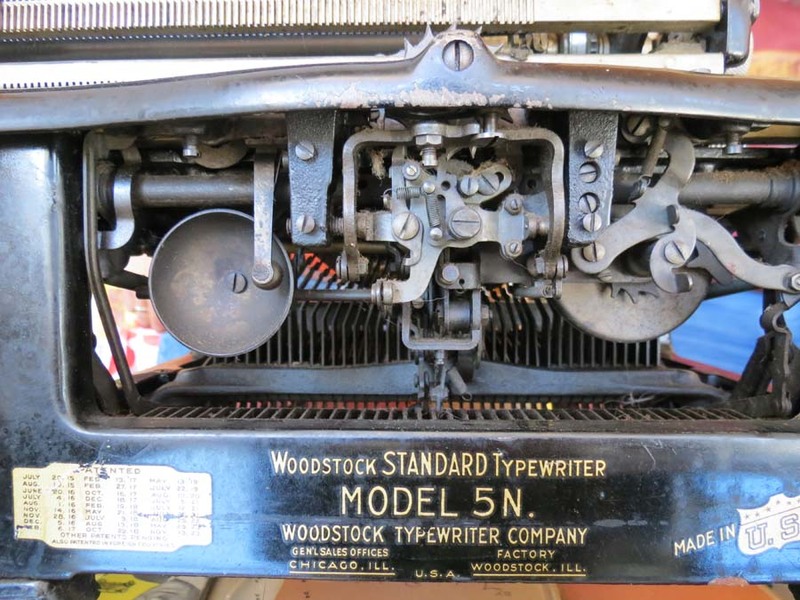 This lovely old Woodstock typewriter was manufactured in Woodstock, Illinois, the little town where the Bill Murray movie “Groundhog Day” was filmed. Could there be a connection? Back to the past? The past living on in the present? The machine was produced close to the time my father (now deceased) was born, almost a hundred years ago. It still works. 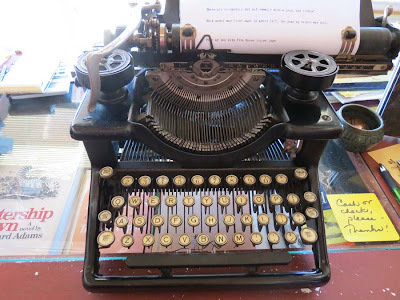 How many poems and short stories and novels were composed on typewriters in the century of the machine’s dominance? Remember the three mystery poems I received in the mail earlier this year? In adolescence I generally wrote letters longhand but loved to type my poems. It felt so much more “professional,” as if I were a “real” writer. Then, to send them off to The New Yorker, in all the naiveté of youth! Such romance! My beloved Civil War veterans--and especially their children--were often big fans of all things mechanical: Bicycles, farm implements, steam-powered boats and locomotives. Typewriters and stenography became a ticket to financial independence for their granddaughters, just as the milliner's art had been for women in their own day. The more things change, the more they look awfully familiar, eh? I wonder what sounds from the 1910s would be completely incomprehensible to us today? Darn! Now I’m disappointed all over again that I failed to get my video uploaded. The sound track was as good as the scene! Gerry, did you ever see the movie “Tess of the d’Urbervilles,” made from the Hardy novel? I loved the sound track, with all the clattering noise of the era’s agricultural machinery. The more digital the world becomes, the more I yearn for old machines--but I do NOT want to be a secretary again! And it's not at all the same thing to provide digital "sound effects" that pretend you're using an analog machine (prime example: cameras). My folks had a typewriter just like that that Mom used up into the 70's. There was a certain smell that the ribbon in the typewriter had...and looking at these photos suddenly I could smell it again. Fun memories. Ian, my first experience with sound effects added was the new, late, trying-to-catch-up-with-video-games pinball machines. Ah, the old pinball machines! Ching-ching! Dawn, I find it intriguing that you remember a smell from typewriters. People often come in my bookstore and deep deep, satisfied breaths and tell me they love the smell of books, but it's so much a part of my life that I don't usually notice. Or should I try to be more aware of aroma in general? Thanks!